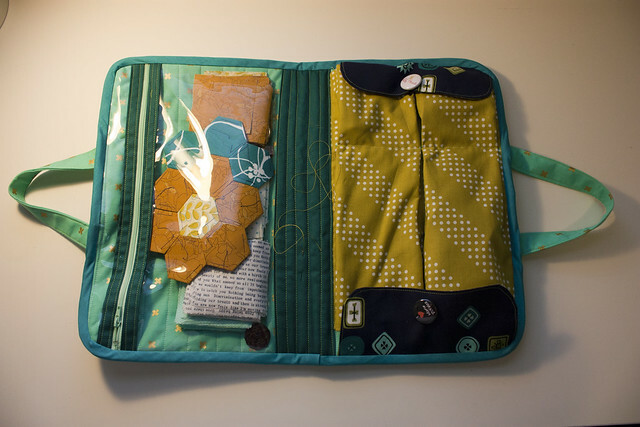 An A2MQG guild mate, Amy of Blotch and Thrum, showed off her Road Trip Case at one of our recent meetings and it inspired me to make one for myself. 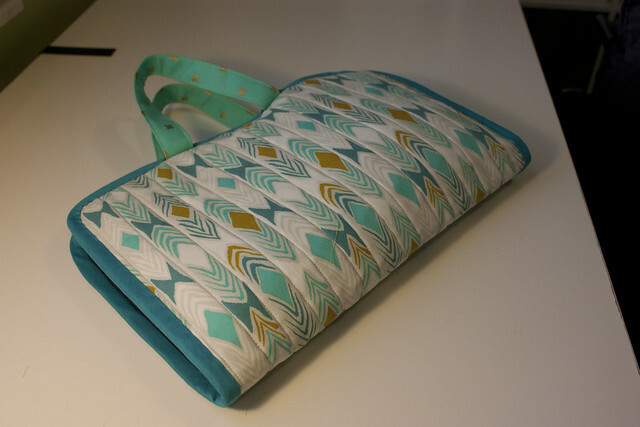 I pulled together an assortment of Cotton + Steel prints for my bag and stayed up a little too late finishing this. So late that I made a lot of groggy, sleep-deprived mistakes. Luckily, the pattern is well-written and forgiving and I still managed to come out with a great finished product. I've been slowly pulled over to the dark side of English Paper Piecing, thanks to my friend Sarah, and I finally decided to go big or go home. 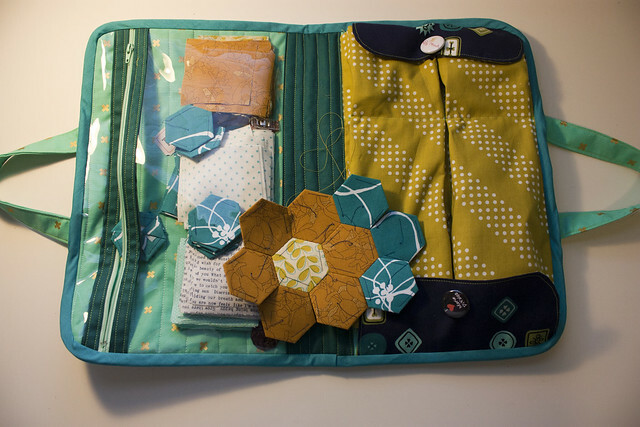 I pulled together a palette of low volume prints, gold, turquoise and navy fabrics and hope to make a lap sized quilt of three ring hexie flowers. This is definitely going to be a long-term project as it will require around 1500 hexagons (check out this great EPP quilt size calculator). 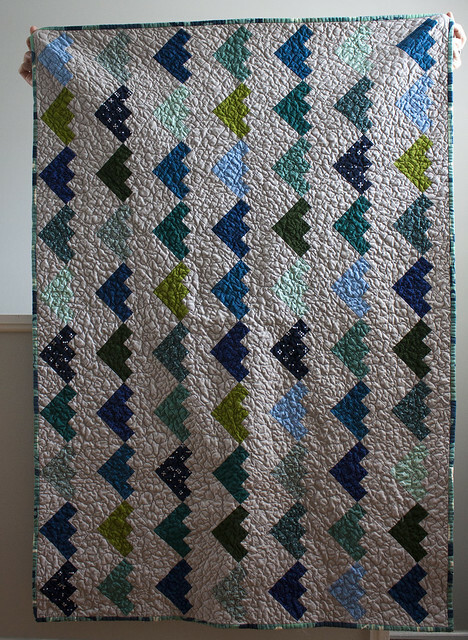 I'm linking up to Freshly Pieced's WIP Wednesday feature with this post. 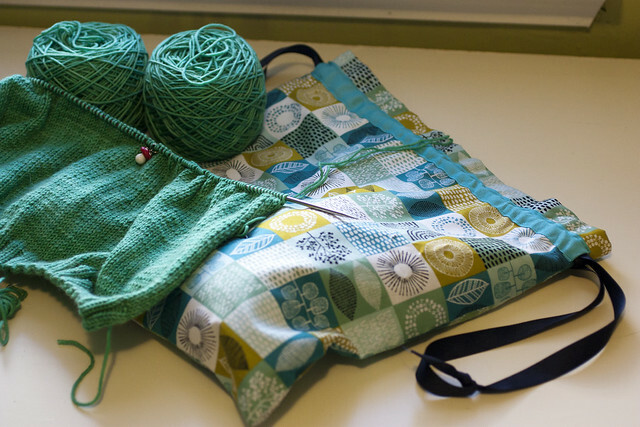 My husband likes to joke that every time I cast on a new knitting project, I always make an accompanying bag. He's right. 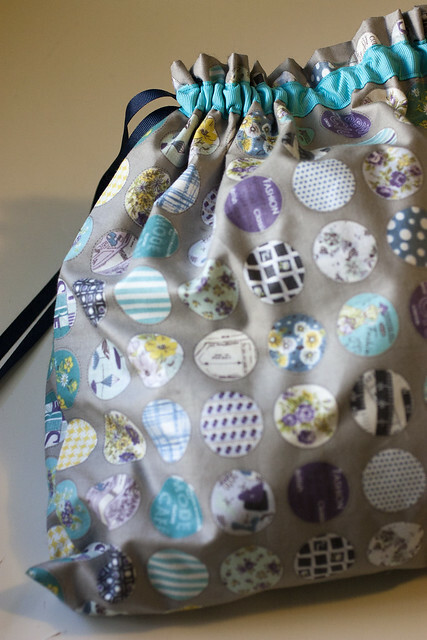 Project bags are so much fun to make and it's so nice to have a favorite piece of fabric on display whenever I work on my knitting. A few weeks ago I put together two large drawstring bags. These are around 13"x13" and hold up to six skeins of yarn (and the accompanying sweater and needles). 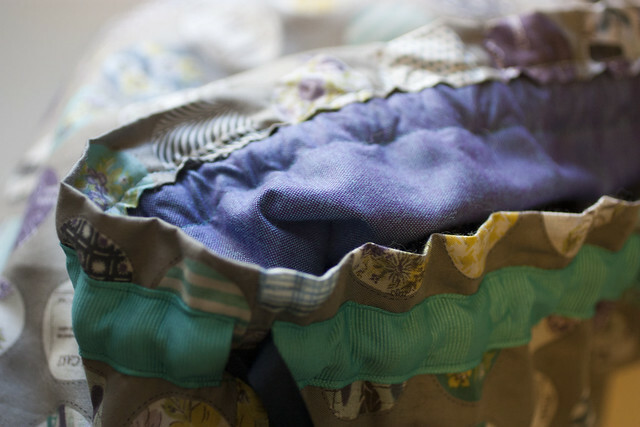 While I love the outside fabric, I love the purple peppered cotton lining even more. Can that chambray be any prettier? Since it's the second annual Plucktember knit along this September, I'm spending most of my crafting time knitting the Gnarled Oak Cardigan from Coastal Knits. I'm using Plucky Primo Worsted in the Modern Vintage color. This yarn is an absolute dream to knit with and the color is so vibrant. We'll be in Oregon for a week at the end of the month, so I hope to spend some of our vacation finishing this up. Last summer new neighbors, who just so happen to share many of the same interests as Jon and me, moved in. 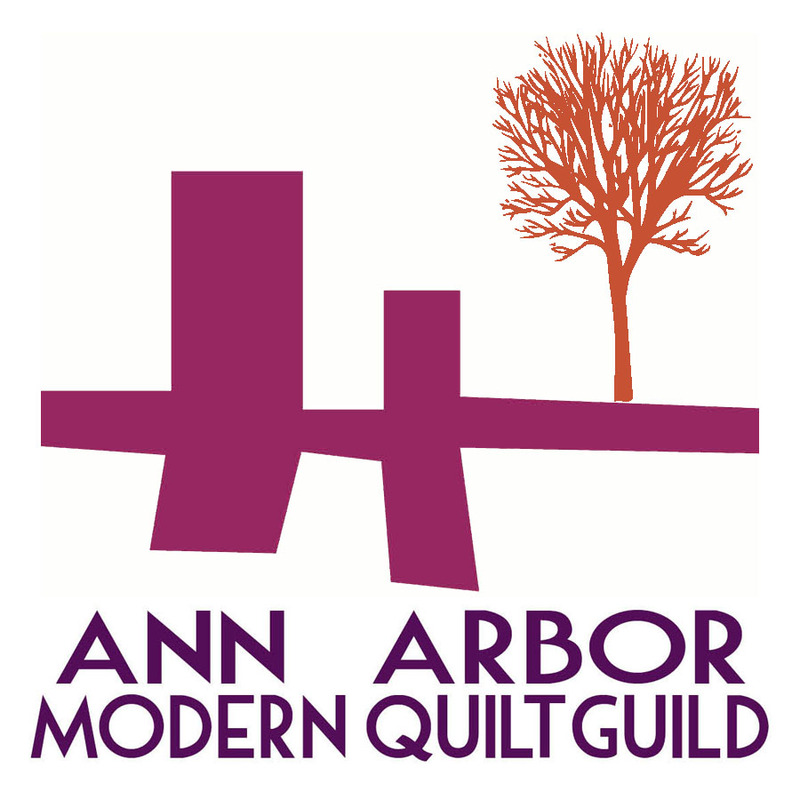 I never in a million years dreamed that someone who is almost as crazy about knitting and quilting as I am would move in next door. It boggles my mind! It's so much fun to have impromptu craft nights in each other's home after a long day at work. 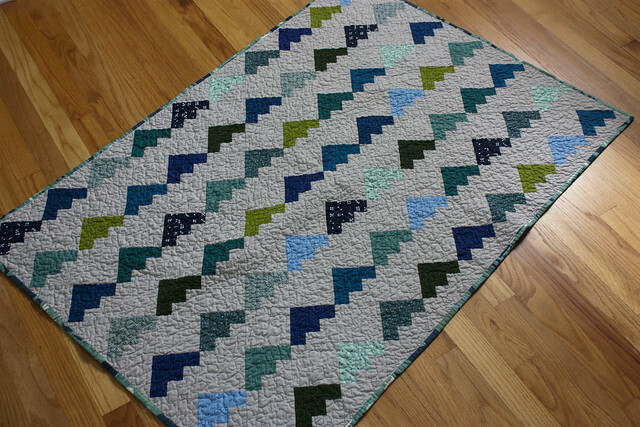 They're expecting their first son later this fall, so I made him a baby quilt for his new nursery. 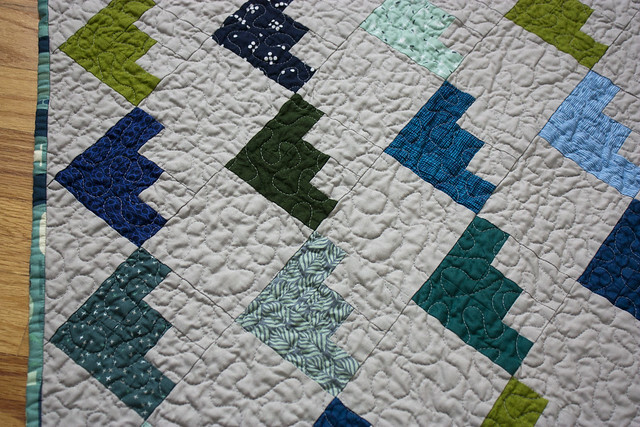 The quilt is 34"x52" and is made up of 70 log cabin blocks on point. 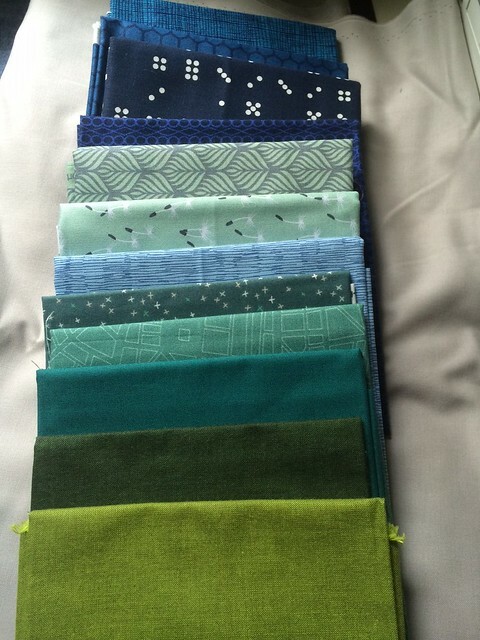 I shrunk this pattern down to size and pulled together a palette of fabrics that should hopefully match the nursery. Koko had to get comfy with the quilt before I could wrap it up for the shower. She's looking forward to having a new playmate next door. She loves staring at babies! I quilted this with dense stippling and I'm so impressed with the crinkle factor of the cotton batting I used. 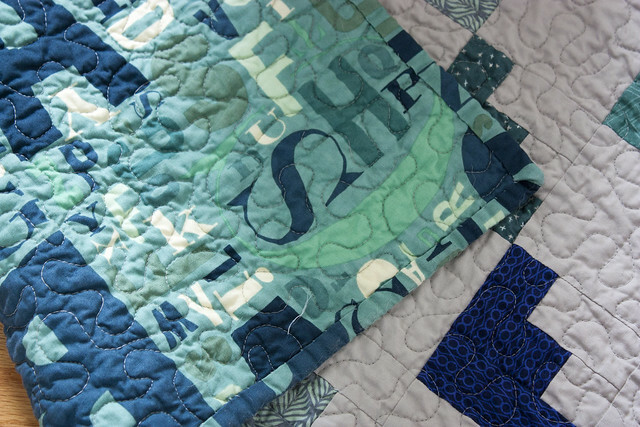 The quilt is bound and backed with some fun alphabet fabric. The librarian in me loves using text prints for babies. 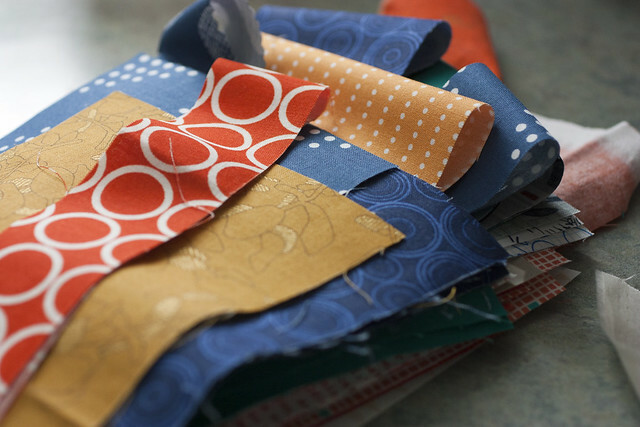 On Sunday afternoon, I had a cutting extravaganza and cut out fabric for several new quilts. 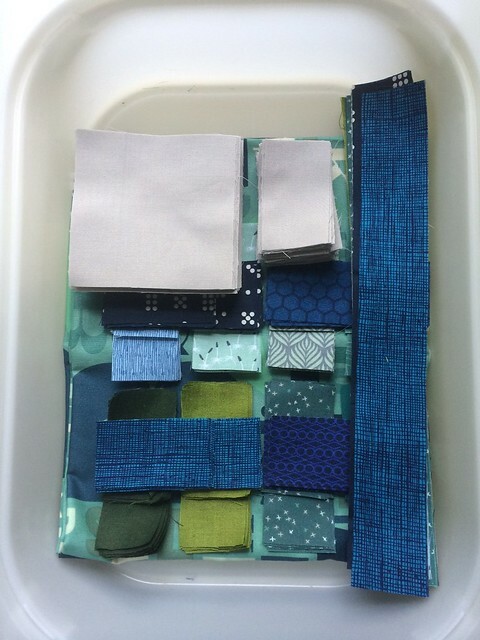 Cutting is one of my favorite parts about quilting and I always enjoy turning a stack of potential fabric into a pieces for a new quilt. I've got several projects in the queue, but for now I'm focusing my attention on making a patchwork quilt for our guild's charity project this year. 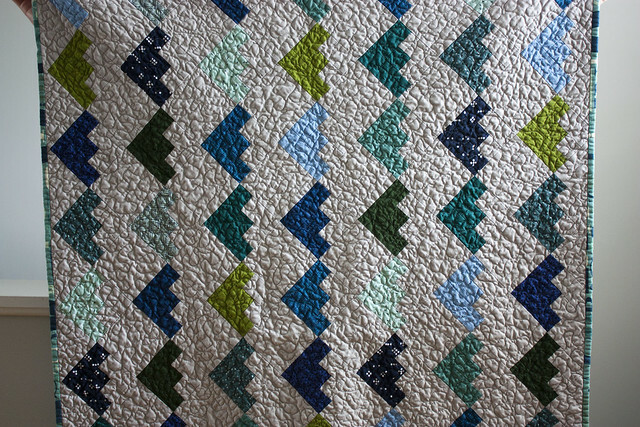 My inspiration for this quilt was a fun navy robot fabric that I found in my deep stash. 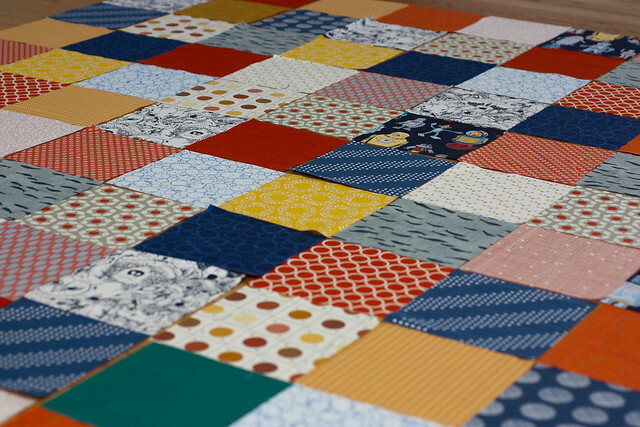 I pulled an assortment of coordinating orange, red, yellow and navy stash fabrics and cut each fat quarter into six 6.5"x6.5" squares. 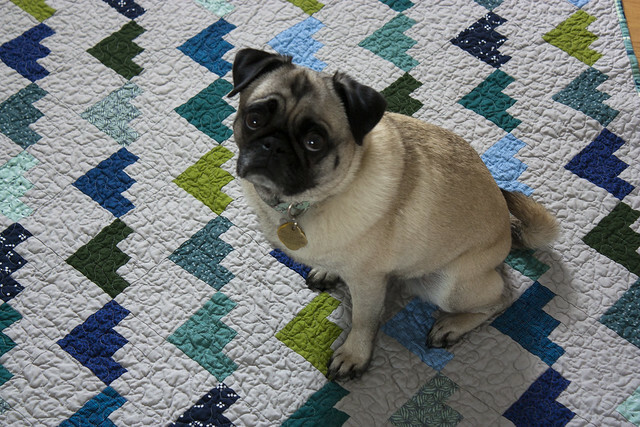 The final quilt will be 9 squares (54") by 13 squares (78") to make a larger quilt for an older boy. I've got a coordinating flannel that I'll be using for the backing and I hope to turn this into a cozy and comforting patchwork quilt. Lately, I've been on a cross stitching kick. True to Rebekah form, I found a new hobby I enjoy, collected lots of thread and patterns, and started several new pieces at once. Luckily I was able to finish up my first large scale piece earlier this summer. 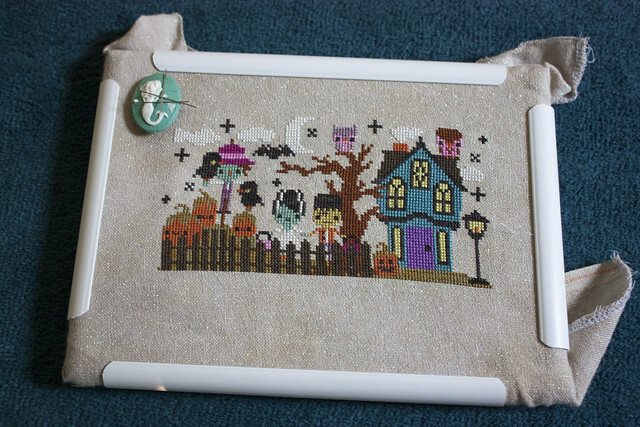 The Frosted Pumpkin Stitchery's Cherry Blossom Sampler was a ton of fun to put together. 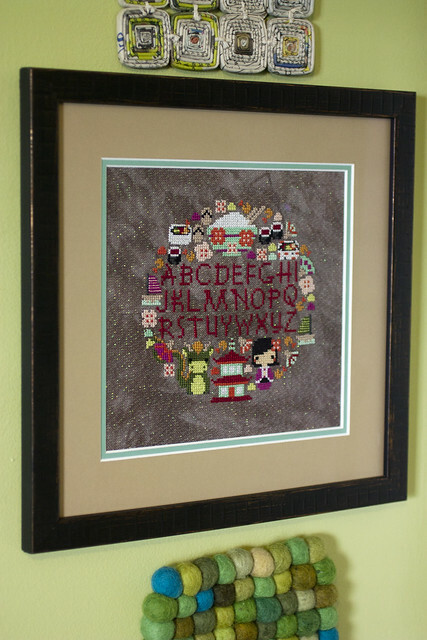 I spent many warm summer afternoons listening to audio books and stitching away on our back patio. The finished piece was framed at a great, friendly local frame shop that does quality work and I'm now hooked on custom framing. 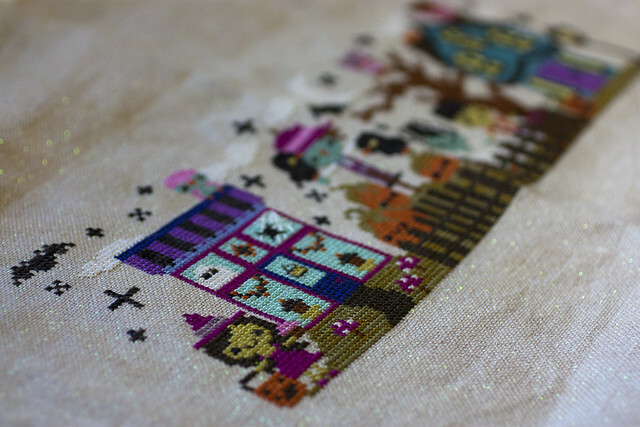 Right now I have three pieces in progress: Stitchrovia's Vegetable Sampler, Satsuma Street's Pretty Little Tokyo, and The Frosted Pumpkin Stitchery's Halloween Town Club mystery stitch along. I'm eagerly awaiting the final clue reveal a week from Thursday so I can finish this up and have it framed in time for Halloween. I changed and rearranged elements of the third clue and adjusted the color of the house and door, but everything else follows the main pattern. I'm not really a Halloween fan, but the kawaii designs and pretty colors sucked me into this pattern!